CES 2016 has been a showcase for specialized fitness trackers beyond the usual step and heart-rate monitoring. 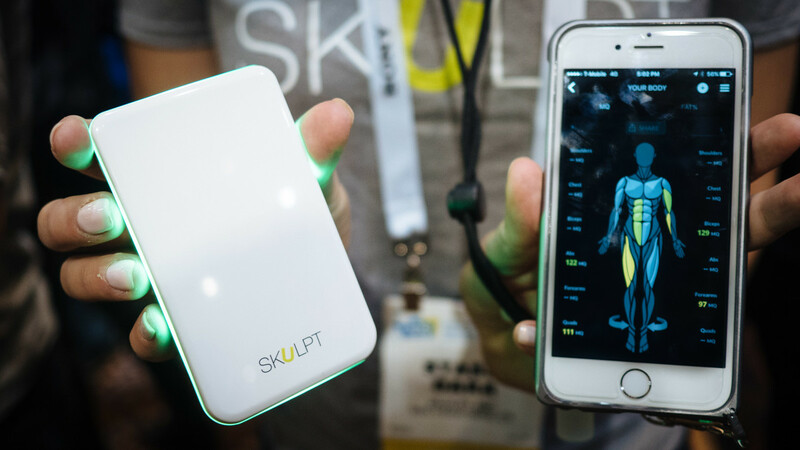 The Skulpt Chisel, a $99 handheld device that measures your body fat and muscle quality (that’s a real scientific term), is meant to monitor your results and progress more than your training. Body fat percentage is one of the better indicators of overall fitness – much better than the utterly useless BMI (body-mass index) – and an important metric if you’re trying to lose weight healthily or build muscle without becoming gaining too much fat. Problem is, it’s really hard to measure accurately. Online calculators can be off by several percentage points (often the difference between ‘I should have abs already’ and ‘I shouldn’t eat that brownie’), and proven methods like hydrostatic weighing or DEXA scans are both prohibitively expensive and too inconvenient for frequent use. As for those ‘bioimpedance‘ scales that send an electrical signal through your body? While the science behind them is fine, the implementation is notoriously inconsistent, varying tremendously based on your hydration levels, weight distribution and even ethnicity. The difference amounts to multiple more precise sensors which can focus the electrical signal to different depths, as well as the fact that you use the device to measure fat in different areas separately (overall bodyfat estimates use your triceps, abs and quads). All that means the electrical signal can actually be directed at your lean muscle mass instead of just wandering aimlessly as with the vast majority of impedance methods. It also goes a level deeper than other devices, by tracking ‘muscle quality.’ While it sounds like a hocus pocus marketing term, it’s basically an estimate of your intramuscular fat. The less intramuscular fat, the more force a muscle can produce relative to its volume – think a leaner cut of steak. Being able to measure muscle quality can theoretically help you identify weak links and decide which body parts need some extra TLC. Chisel is actually the company’s second device, a follow up to last year’s crowdfunded Aim. Scouring through user reviews and impressions, the consensus seems to be that estimates were actually quite accurate relative to DEXA – an impressive feat – but the device was sometimes glitchy, had a poor build, and was too expensive at $199. Skulpt’s listened to user feedback, removing the screen from the Chisel to make it lighter and help bring down the price to $99. Users also complained about the slow charging on the Aim’s NiMH battery (10 hours! ), so the Chisel tops up in a much more reasonable two hours and lasts two to four weeks on a charge thanks to standard lithium ion tech. Although we’d need more time with the device to be sure, holding it myself at CES, I had no concerns about build quality. Also, since all the interaction happens via the app, users don’t have to worry about a wonky interface on the device itself. It’s a refreshingly different take on fitness tracking than the usual activity metrics; the Skulpt is about improving performance through results. and is a more useful tool for tracking progress to your aesthetic goals as well. Chisel will finish up funding on Indiegogo by tomorrow, and begins shipping to backers in March. It starts at $99.